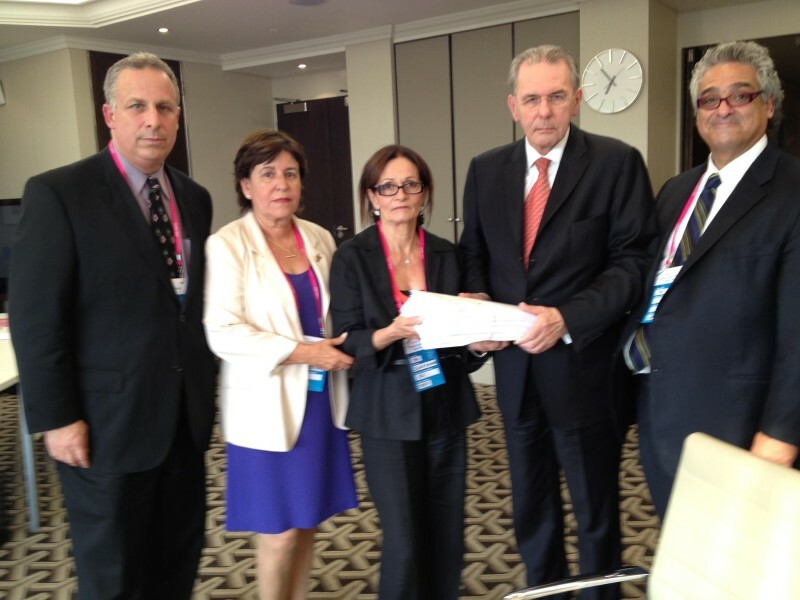 Jacques Rogge, IOC president, second from right, receives the petition requesting a minute of silence at the London Olympics for the Munich 11, pictured with, from left, JCC Rockland CEO David Kirschtel,; Ankie Spitzer and Ilana Romano, Munich 11 widows; and Steve Gold, JCC past president. The Munch 11 may finally get what’s due to them — 44 years after being murdered at the 1972 Olympics. Kidnapped by Palestinians terrorists, then killed during a botched rescue mission, the 11 Israelis to this day remain unmemorialized by the organization that oversees the very games in which they came to participate. But that appears about to change. On March 1, Ynet News reporter that the International Olympic Committee’s President Thomas Bach indicated that at the 2016 Olympics in Rio de Janeiro, there would be an area set aside to commemorate the murdered Israelis. In addition, there will be a “moment of reflection” during the closing ceremony to acknowledge those who have died during any Olympic Games. Spitzer is the widow of Andrei Spitzer, Israel’s fencing coach, one of the 11. She along with Ilana Roman, the widow of Yossef Romano, have represented the families officially for more than four decades. The proposed moment does not at the opening ceremony, which is what the families have always desired. And it’s not focused solely on the Israelis. Spitzer wants to see the fine print, to make sure that remembering everyone who died at the Olympics is not going to include the Black September terrorists who perpetrated the Munich Massacre. But so far, on the surface, everything looks promising. “The families are pleased, so that’s the most important thing,” she says. As someone who watched, wrote about and participated in JCC Rockland’s petition campaign for a minute of silence to memorialize the 11 at the 2012 Olympiad in London, I was at first unsure how to react to the IOC’s move. In some ways, it seemed like a half measure, not the triumphant victory that would bring some sense of justice to a wrong that can never be made right. But Spitzer is convinced the IOC did not want any more bad press, like the organization received during the Minute of Silence campaign. The organization was on one side, and world opinion lined up against it. And still, the IOC refused to budge. That campaign began with a crazy idea, that a small JCC could make a difference. The J took on the cause, something the families had been pursuing since the 1976 Olympics in Montreal. They wanted one minute of silence to mark the deaths of their loved ones. And it was simply one minute too many for the IOC. The 2012 petition spoke to people’s sense of justice, and to their hearts. And it spoke about the power of reaching beyond your grasp. Somehow, Kirschtel managed to sell Ankie on the idea that the JCC could make headway where the families had not. He really believed that the JCC could make a difference for the Munich 11 families, and he pulled them right along with him. When the JCC agreed to host the JCC Maccabi Games, Kirschtel proposed dedicating them to the memory of the murdered athletes and the board of directors supported that move. The Games, a large Olympic-style competition for Jewish teens, is a program of JCC Association (full disclosure: I work there), the leadership organization of North American JCCs. Starting in 1994, the organization had made including a tribute to the Munich 11 a part of each JCC Maccabi Games opening ceremony. This gives teens a sense of history and responsibility to it. It appeals to their sense of justice. And, of course, it is a way of doing what the IOC simply would not. During the Minute of Silence campaign it was incredible to see the signature count increase each day on the petition, surpassing first 1,000, then 10,000, and finally an unbelievable 100,000 – for a then-40-year-old cause. It connected Jews around the world. One of my favorite moments during the entire year came when a childhood friend of my husband, who now lives in Australia, passed the link to the petition back to us via Facebook, asking that we sign. He was completely unaware that the petition originated with our community. As the Olympics neared, it seemed like the JCC might even claim victory. Of course, it did not. Until now. This effort began with Kirschtel, and a kind of crazy idea: That the JCC could make an impact in the world. And it has nothing left to prove. JCCs can make a difference; there is power in them and in the scope of a movement that had kept the memory of the Munich 11 alive long after the cataclysmic events of the ’72 games. The effort quickly moved beyond the walls of the J, and became first a Jewish cause, with the help of such organizations as JCC Association, and Jewish Federations of North America, among others; and then simply a just cause that spoke to many others, such as the students at Catholic University. When a cause is just, it does not stop at borders, religion or affiliation. The momentum eventually propelled the Minute of Silence campaign onto the pages of newspapers, and the actual petition into the hands of Jacques Rogge, Thomas Bach’s predecessor, when Kirschtel, Spitzer and JCC board members Micki Leader and Steve Gold traveled to London and met with him. But at its core was one JCC with a lot of heart, a sense that 40 years was 36 too many, and that the time to remember is now. And it seems that finally, the IOC, has heard us.